Au revoir! 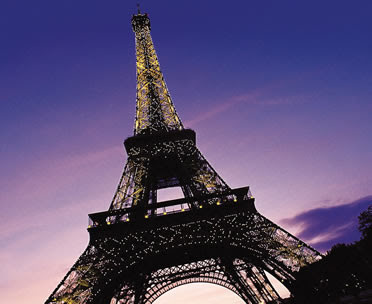 My Hubby and parents and I are heading off for a fabulous vaycay in France and the City of Lights! I am SO excited! My camera is fully loaded with a new lens and a new tripod, and I have been reading every photography book I could get my hands on. I have about a dozen empty memory cards waiting to be filled with the most wonderful pictures of... well, Frenchy French things. And I will share some of the best with you. Here is a sneak peak. 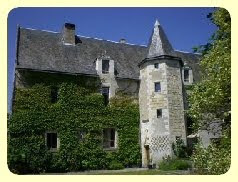 I am very excited because one night we are staying at this bed & breakfast, the Manoir de l'Abbaye in the Loire Valley. And this is the bedroom - MY bedroom! Yes, ladies, that is TOILE! Real French toile in a real French B&B! 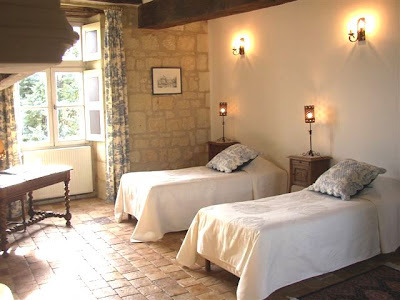 You all know my passion for toile, and when this happened to be the only available room anywhere in the Loire, I knew someone above was smiling on me!!! 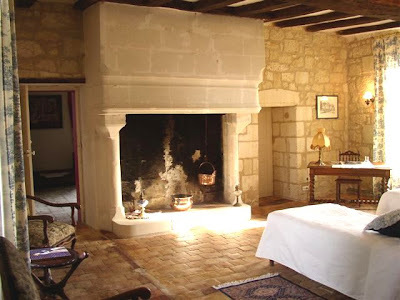 Stone walls, and a huge fireplace with copper pots hanging in it. Really, does it get any more French than that? That is just a tiny taste of what is in store for me! 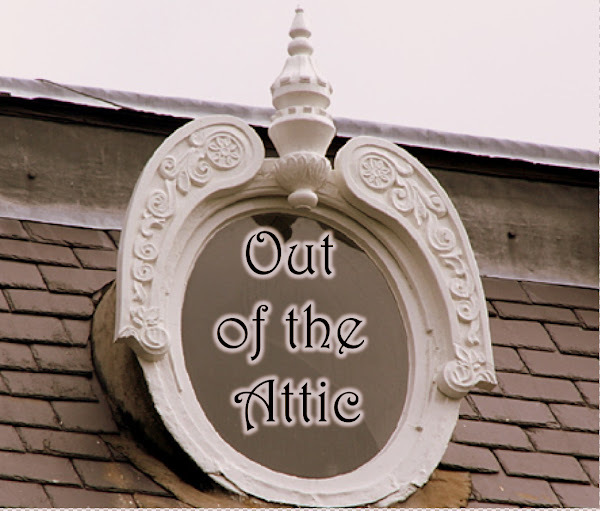 Can't wait to share some of it with you, my favorite attic diggers! I love any ideas that help me to be more organized. Heaven knows I need it! My friend, Anna Jensen, shared this idea with me from a magazine months ago. (The picture is small so be sure to click on the actual picture for enlargement.) These acrylic file holders (a 3-pack from Office Depot) are located by my back door which is close to my garage, kitchen and my office. Each school-age child has their own holder and their picture shows which one is theirs. It holds their homework, papers to be signed, projects to do, etc. Do you think this will get us organized? Only time will tell. Within this blog, there is a lot of "talk" about Tai Pan Trading so I thought I would pull out the camera so you can at least see what we are talking about quite often. Lots of creative juices will get flowing. Do you think you want to shop there?? Does it makes you want to decorate for every holiday? I know it does for me. You'll have to go sometime. One store in Rancho Cucamonga, California and many stores in Utah. Definitely something for everyone. Now stop your drooling and go. I was loaded down with inspiration and ideas while I was there, and I can't wait to get busy stamping, and share with you what I come up with. But right now we are getting ready to walk out the door for another family vacation in about 10 minutes. Before I go, I want to share with you just a tiny snippet of some of the fabulously spooky projects I saw there. Late last Saturday night I realized that I was supposed to give a lesson to the teenage girls at our church the next morning. Yikes! Usually I like at least 2 weeks to prepare! The topic was "Choice and Accountability." Thinking quickly, I remembered these cute little piggy banks I had picked up a TaiPan a month or two ago. They were only $0.91 each, so I picked up several, thinking I might be able to use them for just such an occasion. I also picked up the bigger one for all of two bucks. It wasn't hard to figure out how to make piggy banks work to teach accountability - the root word is 'account', as it 'bank account' or 'accountant'. There you go! But the piggies were plain white, and I tried to figure out how to make them a bit more, well, darling. I tried stamping on them with Staz-On, but the stamps kept slipping on their shiny round little rumps, so that was not going to work. Then I remembered my rub-ons! They worked perfectly! I quickly rubbed some little flowers onto their little ham hineys, and they were done! Then using the printer, and some stamps and punches, I quickly made some little "coins" to stick in the coin slot that say "Choose to make deposits in you Celestial Account daily." For my lesson I hid the little piggies, and just had the larger one on the table. I had a bunch of coins and bills, and talked about how there is an accounting made of each of our choices, and when we make good choices it is like putting money in that account. We talked about different choices we make, large and small, and with each suggestion, I put a coin or bill in my piggy bank. We talked about how fast you can fill up a piggy bank with just small change - the little good decisions we make everyday - like obeying our parents, being nice to you siblings, or smiling at someone. It worked out great. Then I revealed the tiny little piggies. The girls were delighted! They loved them! I told them that every time they get handful of pocket change they need to remember that all those little everyday choices add up to a lifetime of happiness! Don't you just love it when you get a bit of inspiration after you've completely blown it? While I was visiting Santa Fe with my family last week, I happened upon a camera store, and since I have become somewhat of a amateur photographer as of late, I slipped inside. The lady there was very nice and suggested I try a circular polarizing filter for my camera. I had heard of them, and understood already the concept behind them (how they cut glare by blocking out all light waves except those traveling in one direction), but had never actually tried one. So on a whim I said, "I'll take it." I was a bit surprised when it rang up to be over $100! "Oh my," I thought, "It better be worth it," and slipped out into the sun with my new purchase in place. Just a few minutes later I came upon this great old church and took a picture. Then remembering my new polarizer, I simply turned the filter and took another shot. Wow! I was shocked at the difference, even viewed from my small camera screen. Before, the picture did not capture the great colors and textures that I saw with the naked eye. 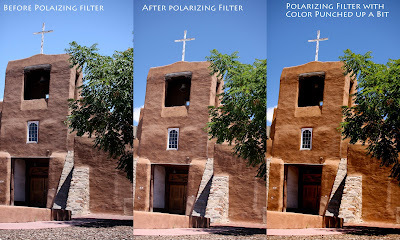 But as soon as I applied the polarizing filter, the old church really popped! The cross became much more visible, and the interesting old textures were clearer (I am a texture buff!) Pretty exciting, if you ask me! Here is that same "after" photo with the colors digitally punched up a bit. I just love how it turned out! 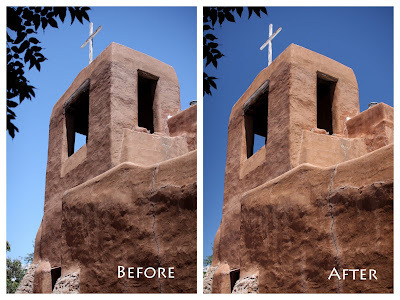 Here is another view of that same church before a twist of the polarizing filter, with the filter, and with the colors digitally enhanced. Spectacular difference! Within minutes I knew I had made a wise purchase. That filter was the only souvenir I bought on that trip, but the pictures I brought home that I took with my new filter are priceless! I just love a new toy! Last week on our family vacation I attended a quilt show in a tiny southern Colorado town of my ancestry called Sanford. The quilt show was just part of the town's extensive Pioneer Day celebrations. One way they felt to honor their pioneer heritage was to display 100 quilts made or owned by the people of Sanford. The quilts were not for sale, but displayed with the names of the quilters, owners, dates, and most had stories to go along with them. Some were very, very old, and many had been made just this year. There were scraps of vintage fabrics and fraying old silks, along side funky contemporary prints. There were machine-quilted quilts and painstakingly hand-stitched quilts. Some were the work of beginners, and others were finely crafted with intricate hand stitching, and artistic color choices. It was fun to see how quilt styles had changed through the decades. There were special family quilts, where every member decorated their own square, friendship quilts, and even a quilt done entirely of prize horse show ribbons. I was excited to discover a few old quilts that we very much like some that I own (garage sale finds all). My sister who is a seamstress, really appreciated the sewing skills of these talented quilters. My mom and I, who love anything old, really enjoyed seeing the terrific vintage fabrics, wondering about all the people those old quilts have warmed through the years, and the various beds that they have adorned. We were all amazed at the creativity and artistry of these women through the ages who put their time, talents, and hearts into these quilts, and we pondered on the thousands of collective hours put into piecing and stitching them all! 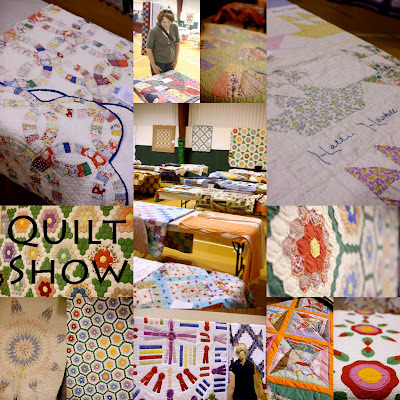 I love quilts, and I found this quaint small town quilt show simply inspiring.